Exclusive documents obtained by SaharaReporters reveal that Senate President Bukola Saraki, along with other members of his family, played a role in bankrupting Societe Generale Bank of Nigeria (SGBN), in one of the most compelling failed bank dramas in Nigeria’s economic history. Mr. Saraki, a former governor of Kwara State who has been making headlines in recent weeks after snatching the seat of the Senate President by cobbling together a coalition of loyal Senators from the All Progressives Congress (APC) and the Peoples Democratic Party (PDP), joined his late father, Olusola Saraki, and his sister, Gbemi Saraki, in a stealing spree that led to the collapse of SGBN, a Nigerian affiliate of the multinational bank. 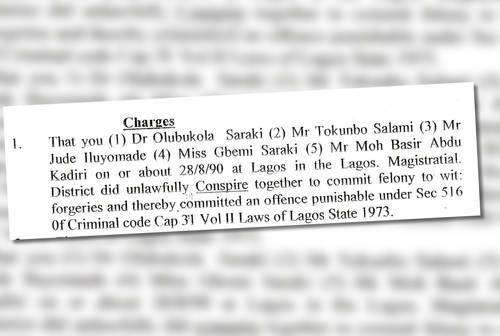 The most revealing documents, which originated from the Office of the Inspector General of Police, detailed a scheme by the siblings Bukola and Gbemi Saraki, along with Tokunbo Salami, Jude Iluyomade, and Mohammed Bashir. From 1990 to 2000, according to the Inspector General’s report dated August 21st 1990, Ms. Gbemi Saraki worked in the Treasury Department of Societe Generale Bank Nigeria while now-Senate President Bukola Saraki was a director of the bank. The Saraki family owned the largest shares of any Nigerian in the bank, a fact they exploited to obtain unsecured loans and engage in several other illicit transactions that saw to the bank’s demise. The IGP investigation resulted in charges against Senator Saraki and Ms. Gbemi Saraki for forgery and conspiracy to commit a felony. The charges stated that the two accused, with “intent to defraud did forge one SGBN [Societe Generale Bank of Nigeria] Inter branch Voucher No LA 005016053-7 for N510, 000 in favor of Trademore International Ltd knowing same to be false and thereby committed an offence.” The charges also stated that the accused “unlawfully committed felony” by stealing the bank’s funds. Senator Saraki, his sister and the other accused persons were slammed with a total of five felony theft and felony conspiracy charges with police file No. AR-1360/X/F/Vol. 12 filed on December 7th 1990.